Our sun kissed tans are fading back to white. We started wearing pants and socks as we are now in the Pacific North West. We have had moments of wanting to turn around and head back to warmer weather but we all know that this move will be good so we continue to push north. We had a great visit with family in the Bay area. We spent 6 weeks with them 2 years ago on the way south and now we were able to reconnect. We also stopped by and spent some time with friends who returned a few months ago to “normal.” It was a great debriefing visit for the adults and since our kids are the same age, it gave them a chance to connect with a peer who they can relate to on a different level (adventuretrio.com). We have less silent time and we all talk more about what we left behind and what our future might look like. We have enjoyed 8 more National Parks (my hat is heavy with all the pins)! We have 2 weeks left of our road trip to home. Namaste is safely tucked in Port Angeles. She made the trip via cargo ship in 7 days and without difficulty. We appreciate beyond words the help and support from our cruising community who helped her load onto the ship in La Paz in our absence and again disembark in Victoria, clear customs, and sail her the 20 miles across the Straits of Juan de Fuca to PA, Wa. We look forward to reconnecting with our former community-to our friends that supported us prior to our trip and to catch up. It actually was snowing at Crater Lake! Flying kites in Long Beach, WA. After tearful goodbyes to our friends in La Paz, we flew to San Carlos. It is an hour flight over the Sea of Cortez and I would almost just recommend taking that flight as it is a beautiful fly over of the Sea and the islands. What took us a month via boat was done in an hour! Matt, the motorhome, and our car were just where we had left them and both were in good order since we left them 7 months ago. We spent just a few days regrouping before we headed to the states. Tucson was our first destination. We flew through the border and started our adjustment to the USA and our new path. It comes in waves. The reality that our trip is “over” sinks in and then it doesn’t. The first week was the hardest so far. We would be traveling for hours with no one saying a word. We were all deep in our own thoughts, starting the mental process of transitioning back to a more “normal” existence. We were all moody, snappy, and short with each other while trying to enjoy our road trip adventure. Our first stop, Glen Canyon National Park, Horseshoe Bend, and Antelope Canyon were spectacular. Page, AZ is filled with natural beauty and man made engineering feats that created Lake Powell. While we were in awe of our surroundings and experiences we had, we all still were troubled and each of us having moments of snappiness. Since communication is key, we would talk about our feelings and we all were in different places. Journey was looking forward to meeting new friends, checking out new schools, and looking at new houses. She talks about taking a gap year to travel either after High School or College and wants to travel while in school. Of course we had to remind her that she will have to work to earn money for all this wonderful travel. John, well, change is always more difficult for him initially. He was not dealing with the immediate future of jobs and house hunting, but spends his time looking at RV’s for retirement to take down to Central America. He wasn’t ready to talk about jobs or houses so I would just drop little snippets to help him adjust. Lastly, is me. I trudge forward. I have had 2 interviews via phone calls from Mexico, I have been looking at houses for the past year on the internet, have been in touch with a realtor, and embracing what comes next. I will miss our cruising life, it is just time to move on, for Journey. I know we will travel again in some capacity so I find comfort in knowing that our trip is not the last hoorah. Norma & Christian and the crew of sv Namaste in La Paz. We will miss these two so much! Our gift to the cruiser's shrine. Some how the universe knew that our last trip in the Sea of Cortez was happening as Mother Earth showed us an unbelievable time. We left La Paz and headed out to meet the Women Who Sail (WWS) Rendez Vous. WWS is a closed FB group that I have been a part of for years as a space for women to share information related to sailing. About 60 women from around the world came and it was great to meet so many people "in the flesh". There were also about 6 BYOB'ers that participated. We spent 4 days with the group, enjoying camaraderie, giving tours of our boat and chatting about cruising life while visiting amazing anchorages. 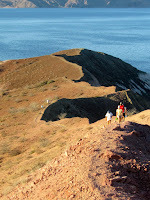 We swam with the sea lions of Isla Islotes, enjoyed a sunset hike at Isla San Francisco, and enjoyed group dinners. We said goodbye to the group as they made their way back to La Paz and we were headed North, into the Sea. 1. Turning the boat around as we passed 2 other cruising friends heading south that we hadn't seen in a while to reconnect in Agua Verde. We topped the evening off with a beach bonfire with about 6 cruising boats. 2. Discovering the beautiful anchorage of San Juanico. Majestic rock spires jut out from the Sea providing homes to amazing sea life. We also were able to attend the annual Ship Wreck Party at the "Big House" which as Journey describes it as "The Mexican Gatsby Party." 3. Watching schools of Mantas jump out of the water and swim under the dinghy. 4. Watching a Dorado swim/hunt around our boat in Agua Verde for hours. He/She was so beautiful to watch. Dorado's mate for life so if you kill one, the remaining mate will remain solo for life. 5. Watching a Sea lion hunt the school of fish for hours around the boat. 6. Watching a 7 foot Striped Marlin fly 10 feet out of the water 3x as we sailed by-we were screaming our heads off at such a magnificent spectacle. 6. Dinghy ride down the mangroves and into the lagoon at Bahia Amortajada-we saw sea turtles, sharks, and countless fish. 7. Stopping at Isla Coyote, a settlement of about a dozen homes on a small rocky island, off the grid, in the middle of the Sea. The people sell jewelry and fish. 8.Connecting with so many new and old cruising friends in the Sea. 11. A Blue Whale as we entered La Paz bay. 12. Countless dolphins playing in our bow wake, entertaining us with their graceful acrobatics. 13.Shell hunting on deserted beaches. So there it is. We were going to be out for a few weeks and instead we were cruising for a month as the lure of the Sea beckoned us. We are back in La Paz, decommissioning the boat as the ship is scheduled to arrive on 5/22. Bittersweet. We are ready to leave and start our new adventure but we also know that this adventure has been an amazing opportunity for us. So the reality is starting to hit us as we say goodbye to friends, La Paz, Mexico as our sailing adventure closes. Cruising kids playing with fire because they are not supervised by responsible adults...JK! Nanuq is a salty dawg! Namaste at anchor at Bahia Amortajada, Isla San Jose. One of our favorite spots as you dinghy through mangroves into a huge lagoon where we saw sharks, turtles, and beautiful fish. San Juanico is one of our favorite anchorages-great beaches, great snorkeling, and good wind/wave protection. WHAT ARE WE DOING NOW??? Our original plan was to cruise for 2 years and then reassess. Well, reassessment time came and we decided to go home. The best reason and the main reason is for Journey. I can only relay her feelings, but she has told us that while she loves traveling and cruising, she wants to go to school. Journey has big plans for herself and we support her 100%. Part of her plan is going to High School, meet new friends, get involved in her new school, and then a gap year. Being a sailor, we know that plans are written in sand but this is our "now". 2. Sail back to San Carlos and leave Namaste on the "hard" for the next few years. Option #3 was an option and we looked into how this could be done. We have dear friends who offered to sail her north for a reasonable fee and so this was an option on the table. The cons with this was that the ride North can be very difficult for the boat (and crew) which can translate into things breaking which equates to $$$. Option #2 we waxed and waned with as it is super inexpensive (~160USD/mo) to keep the boat on the hard (land). San Carlos is out of the Hurricane belt but basically the boat would be sitting in the desert for several years drying out. That means gaskets on engines and other fittings would dry out, and the constant UV exposure takes a toll on the hull. Option #4 seemed like the best except for the financial piece. There are two companies that ship out of La Paz and we got quotes for both. One quote for 20kUSD and another for 18kUSD. This was not in our budget so we went between Option 2 and 3 with the hope that she would sell and then a whole set of different logistics would evolve. So back and forth, mental gymnastics as we wrestled with the options. This underlying layer of stress was at times difficult to deal with as we are not good with just throwing things to the wind and seeing what the universe gives back to us (insert control freaks). We continued to explore all the options and then we were told about a group of boats going together on a ship and we were given their contact information. We were able to contact them and we were able to be a part of the "group" to get a better rate. Once we got our final quote which was at a considerable discount but still $$, we made our decision to ship. Deep breathe, we committed (sent in the $$) for shipping. So shipping a boat....A large tanker/container boat drops anchor out in the bay (the boat starts it journey in Florida, through the Panama Canal, Costa Rica, and then La Paz picking up cargo (yachts) as it sails. The ship has large cranes that they position over the side of the boat where you then bring your boat next to the tanker. They drop slings and the crew essentially take over the boat while you jump off into a panga that whisks you to shore. We know this to be true as John assisted friends of ours who loaded their boat on the April ship. We don't know when the boat will be in La Paz-just approximate dates. So what to do in the meantime...take off and sail for a few weeks, our last hoorah in Mexico. Here are a few pics from Guatemala since I don't have any pictures of shipping the boat just yet. Our friend Tom flew back on March 16, 2016 and we flew out on March 17, 2016 for Guatemala. We had wanted to do some inland travel in Mexico but as our visa's were coming due, we felt this was a great option. 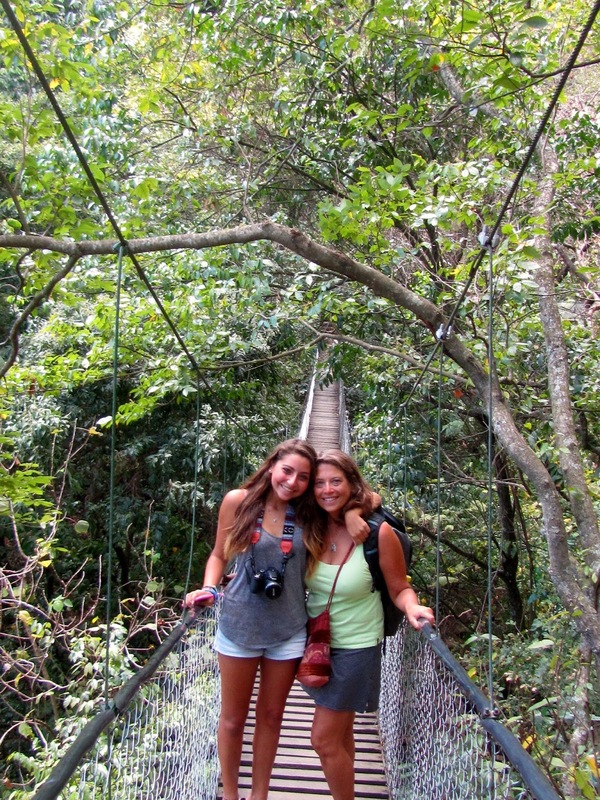 We have heard from other cruisers about Guatemala so we wanted to check it out too. We flew from La Paz to Guatemala City, landed around 2pm and then caught another flight out to Flores. Flores is the capital of Peten, the northernmost state and is an easy jumping off spot to visit Tikal, ancient Mayan ruins that have been uncovered. Flores is a beautiful place, situated on Lake Peten Itza connected to the mainland by a causeway. The town has an European feel with cobblestone streets that wind around the island, beautiful colorful homes that cluster the island and narrow alleyways. It took us all of 20 minutes to walk the circumference of the island. We stayed at Los Amigos Hostel (amigosholstel.com) where we rented a private room with AC/BR for 350Q (8Q=1USD). It is a great Hostel, teeming with 20 somethings buzzing around the garden area where there is a pool table, hammocks, a restaurant/bar and a travel agency. Yes, John and I felt quite old and Journey's eyes were lighting up at the future possibilities of traveling and staying in Hostels. It was quite warm and muggy so we quickly settled into our room, turned on the AC and then made our way for dinner. The restaurant has an excellent international menu serving salads, felafel, hamburgers, pasta,etc. 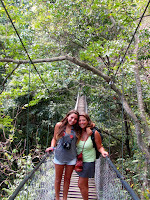 We made our travel arrangements for the Sunset Tour of Tikal the following day. Tikal National Park is the ruins of an ancient city unearthed in the rainforest of Guatemala. It is a UNESCO World Heritage site and dates back to the 4th century BC. We explored the ruins, watching Spider monkeys fly through the trees above us, and listening to the eerie calls of Howler monkeys as they shrieked in the tree tops. We learned about the history of the Mayans and ended the day by watching the sunset over the rainforest canopy while sitting on top one of the pyramids. After 2 days we flew back to Guatemala City (1 hour flight) and then hired a driver to take us to Panajachel (about 5 hour drive) which is on Lake Atitlan. We stayed in another hostel but this time in a mixed dorm that slept 8. Initially we were the only ones but over the 5 days we stayed, the room filled up. Fortunately, we had lovely "room mates" from all over the world. At night we would share our stories from the day and discussed future plans for the next outing. The lake is surrounded by several volcanos and if the weather is clear, one can have breath taking views. Small ferries take you to the many little villages that dot the lake to explore for an afternoon or one can choose to stay in these villages. 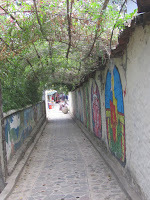 We explored a few of them and enjoyed the unique personalities of each village. On Sunday, we headed to Chichicastenango affectionately known as ChiChi where it is said that it is the largest market is Central America takes place and is open on Sunday and Thursday. Chichi sits at about 6500 ft elevation and is an easy day trip from Pana. Indigenous Mayan K'iche make up the largest percentage of villagers. Most people speak K'iche as their first language and then Spanish. It sounded like a combination of Russian with tongue clicking. People are dressed primarily in traditional native dress of colorful textiles. Artisan goods, chickens, vegetables and so many other products are sold here. The streets are a maze of stalls making it difficult to make decisions about what textiles to purchase as one was as lovely as the next. We can confidently say we contributed to their economy that day. From Pana, we took another bus to Antigua. This time we tried our first Airbnb. 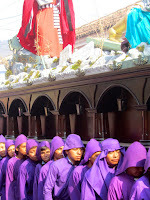 It was also Semana Santa, or Holy week. To be clear, this is an EVENT! 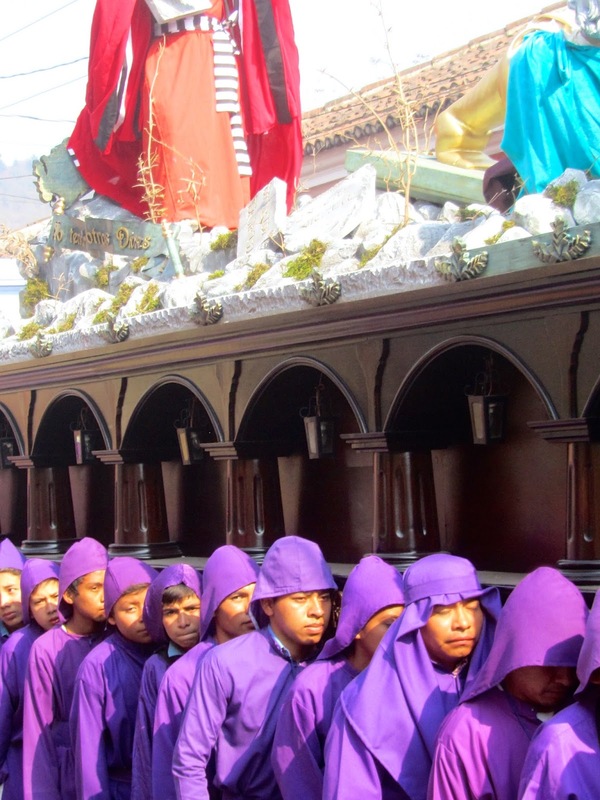 During this week, millions of Guatemalans flock to Antigua to honor the crucifixion and resurrection of JC with parades of floats, elaborate carpet-making and candlelight vigils. We got to our apartment and it was lovely! Everything was as promised via the owner. We had a 10 minute walk to town through cobblestone streets and colonial architecture. Antigua is a lovely city with interesting architecture, dilapidated churches that somehow are charming, boutiques shops and restaurants that will satiate the palate. 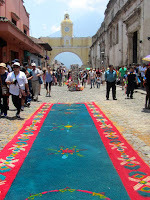 We wondered the streets, enjoying a parade (day and night), as well as the alfrombas (sawdust carpets) as we explored. 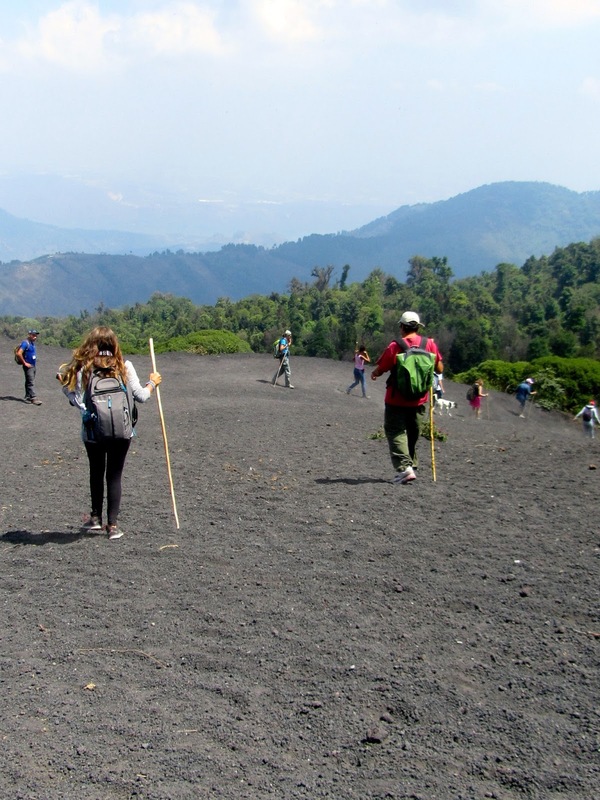 We hiked Pacaya Volcano which is an active volcano and when we got near the top, we watched the steam rise from the cone as we slid on lava. 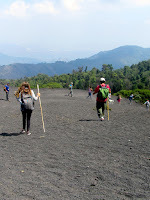 At night we could see Acatenango volcano spewing lava and by day blowing ash into the sky. After 2 weeks, we were ready to come home to Mexico. We returned to La Paz on 3/31/16. 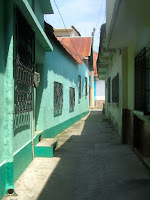 Los Amigos Hostel, Flores, Guatemala. Journey taking it all in. 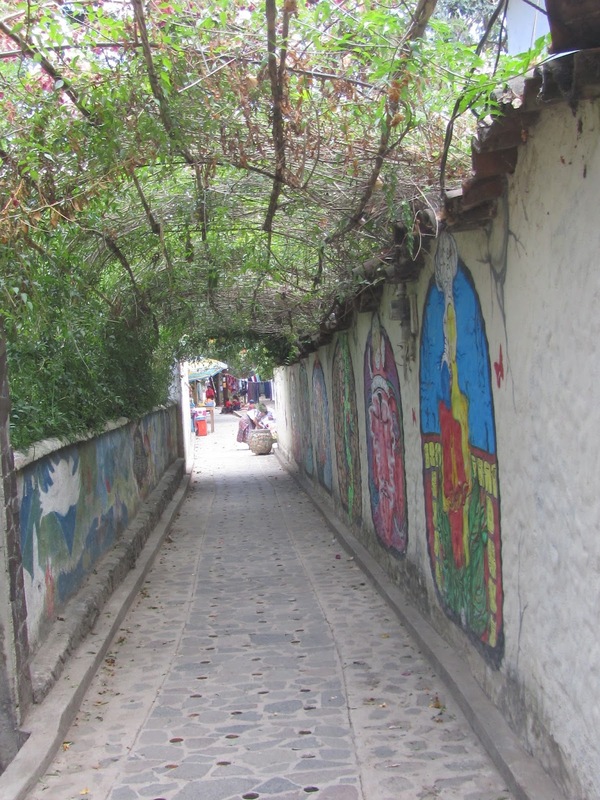 Typical alley way in Flores. The chaos of Chichi. These are the "chicken buses." 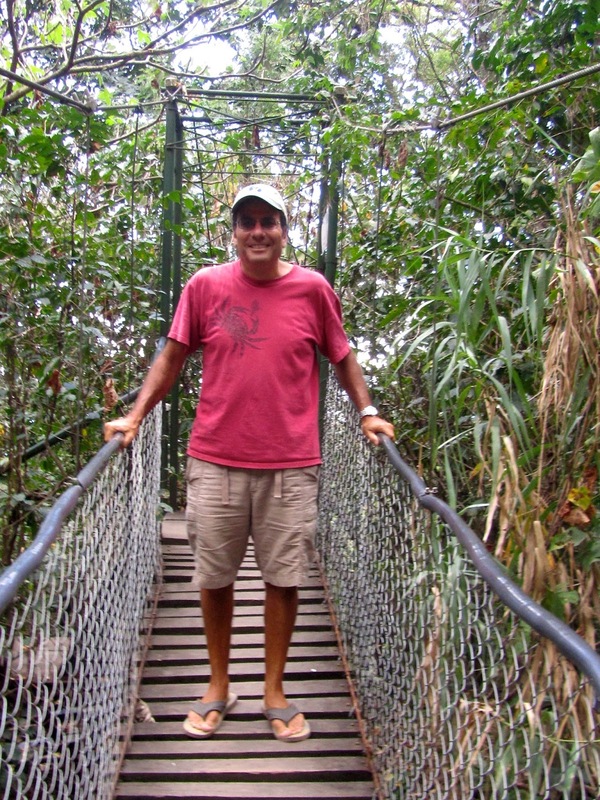 John loves rickety suspension bridges. NOT! San Marcos, a small village on the Lake known for Hippie Culture. There are many times when I thought, "I should be writing on the blog.." and didn't. So here is the summary of the last 5 months. We came back to La Paz this year with the intention of sailing south again to the Mainland. As with most cruisers, plans are written in sand. We love La Paz, and due to the El Nino year, the Northers (Northers are strong winds that come down from the North and funnel down the Sea of Cortez bring large seas and high winds) were quite strong and weather windows were short. 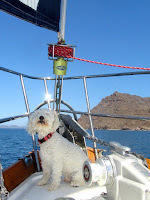 We also had company coming to visit us in La Paz which meant we would only be on the mainland for about 6 weeks. So we got a slip at Marina de La Paz and nested. As a family, we decided that we don't like moving around all the time. It is tiring and we enjoy feeling connected to an area-experience the day to day life. So over the last several months we got involved in many activities. We volunteered at a shelter for battered women and children. Journey saw first hand some very trying circumstances that people live under daily. For example, the children take 2 exposed wires and put them together to turn on the light bulb next to the sink. We also volunteered for the second year in a row at an orphanage, teaching English to teens. The kids love Journey as she is very relatable to them and I enjoy it as well. We volunteered in several fundraisers to raise money for local charities that Club Cruceros www.clubcruceros.net supports. Journey revived her "Island Girl Bakery" business and sold/donated funds and we modeled in a pageant as well. Journey has been busy with 9th grade boat/world schooling which kept us in a steady rhythm. We hung with old friends that we cruised with last year and made new friends. 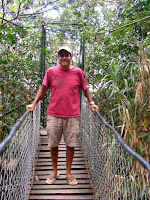 We flew to Nuevo Vallarta to Paradise Village www.paradisevillage.com in January as friends from WA came to visit. It was great for Journey to see her friend, grab some pool/beach time as it was for us adults. In February, our niece, Rosie came to visit for 2 weeks as she just graduated from college. We had a blast as we went to San Ignacio www.kuyima.com with our friends on sv Savarona and sv Astrea to see the mother whales and their new borns in the lagoon. We were surrounded by these grey whales who would spy hop all around the boat to check us out. We also went for a sail to Espiratu Santos for the weekend with our friends on sv Mana Kai. We snorkeled, paddle boarded with dolphins and sea turtles, and had a humpback breach about 25 times. Truly magical. We left Puerto Escondido after a few days and we had a short window that we decided to make the 21hour passage in one shot. The passage started off well, sails up, sun out and we settled into our course. The winds started to build and the sea started to stack-the wind was directly behind us at 20-25k and the seas were on our aft beam. This left the main flogging and a bumpy ride. As the sunset and winds began to build, we decided to reef the main. Unfortunately, we did this a little late as the winds were whipping and as we headed into the wind to lower the sail, we forgot the forward hatch was open just as we buried the bow in the water. I screamed to close it and Journey jumped into action to close the hatch. Disaster was averted and no water went below. As John tended to the sail with his lifejacket and harness in place, he reefed the sail. As the seas bounced us around, John fell into the dodger on his way back to the cockpit breaking the zipper between the dodger and the bimini. We sailed into La Paz at 4 am and drifted outside the channel until first light where we then made our way to Marina de La Paz. Once we docked, we realized that we had broken the aft end of the boom on the track. We think from the stacked seas and flogging sail, the aluminum failed and the car that holds the end of the sail pulled out of the track. 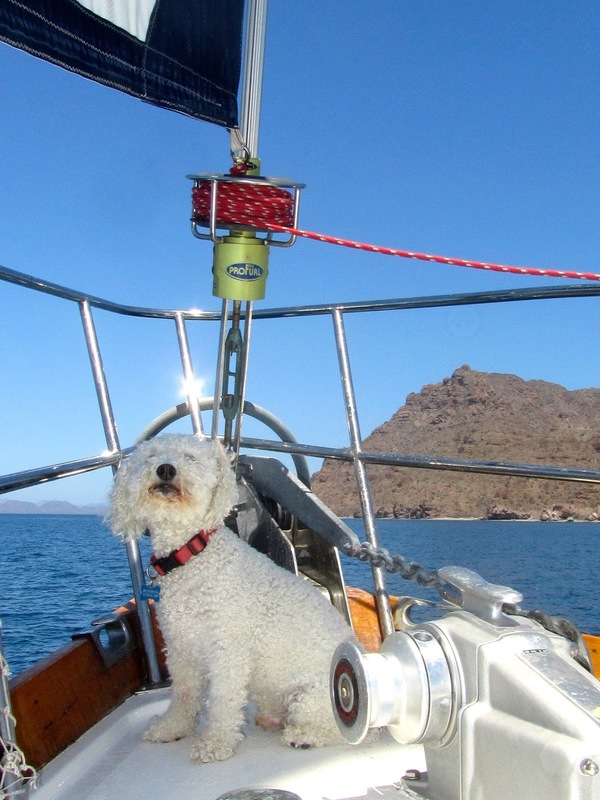 So we spent the first month in La Paz getting reacquainted with old friends, cleaning the boat, repairing the dodger zipper, and taking the boom off for repair. Beautiful sunrises and sunsets do not disappoint! Dolphins are always welcome to ride our bow wake!